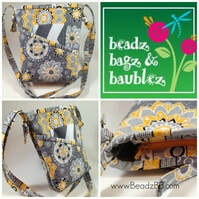 Need a bag for a weekend getaway, a roomy diaper bag or a sports bag? Look no further! You will love the convenience of the end pocket to hold a water or baby bottle. Everything to keep mom & baby organized and on the go, with PUL lining this bag becomes resistance to spills. Don't let this compact size fool you-this little purse holds a lot! Keep all your essentials right by your side. Finished size: 7"x8"x2"
Made with quality cotton fabric, interfacing and quilted for stability and added durability. Fully lined with zipper closure. 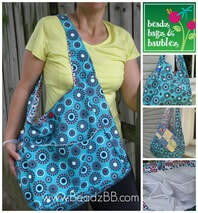 Includes removable beaded zipper charm. Spot Clean.